Built for the bold, the Ford Expedition and the GMC Yukon are both brawny SUVs with larger-than-life offerings. The two vehicles bring excellent engines and spacious interiors, all tied together with a handsome design. 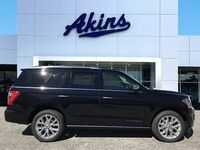 Despite their similarities, the Expedition simply has more to offer than the Yukon both under the hood and inside the cabin. Check out this comparison of the 2019 Ford Expedition and the 2019 GMC Yukon to learn exactly why the Expedition comes out on top. Scoring 17 mpg in the city and 24 mpg on the highway, the Expedition is the more fuel efficient of the two options. The Yukon gives 2 mpg less in each category, getting 15 mpg city and 22 mpg highway. On top of that, the Expedition also brings more power and comfort with a high-quality engine and capacious interior. The 2019 Yukon’s standard 5.3-liter V8 engine produces up to 355 horsepower. The 2019 Expedition’s standard 3.5-liter turbo V6 engine delivers up to 375 horsepower, giving it a 20-horsepower lead on the Yukon. The Expedition’s standard engine also excels with its 470 lb.-ft. of torque. This gives the Expedition a 10 lb.-ft. lead on the Yukon’s standard 460 lb.-ft. of torque. 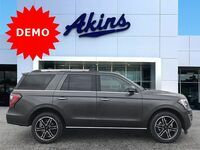 The 2019 Expedition Platinum trim gains a boost in power, reaching up to 400 horsepower and 480 lb.-ft. of torque. Upgrading to the Yukon’s 6.2-liter V8 engine will get you 420 horsepower, but the vehicle taps out with 460 lb.-ft. of torque. The 2019 Expedition carries 171.9 cubic feet of passenger space. This makes the Expedition about 50 cubic feet more spacious than the Yukon, which gives 120.8 cubic feet of passenger space. The Expedition also provides more space to stow with a cargo volume of 19.3 cubic feet. The Yukon lags behind with 15.3 cubic feet of cargo space.